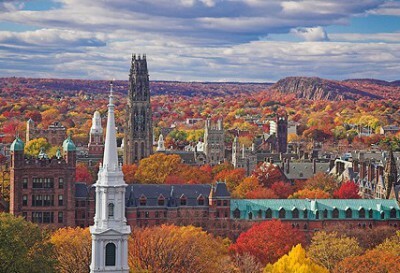 the city of New Haven is known as the home of Yale University and its acclaimed Peabody Museum of Natural History. 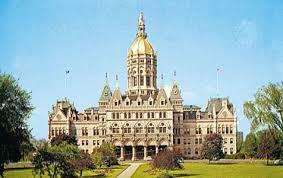 Capital: Hartford Minimum wage: 9.15 USD per hour (Jan 1, 2015) Population: 3.597 million (2014) Secretary of State: Denise Merrill Colleges and Universities: Yale University One of the original 13 colonies and one of the six New England states, Connecticut is located in the northeastern corner of the country. Initially an agricultural community, by the mid-19th-century textile and machine manufacturing had become the dominant industries. The home of Eli Whitney and Samuel Colt, Connecticut was a leading manufacturer of guns and other arms. Today Connecticut lies in the midst of the great urban-industrial complex along the Atlantic coast, bordering Massachusetts to the north, Rhode Island to the east, Long Island Sound to the south and New York to the west. 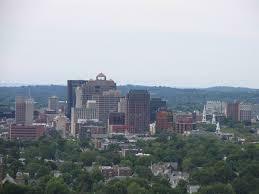 Hartford, in the north-central part of the state, is the capital. 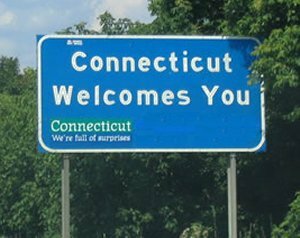 Connecticut takes its name from an Algonquian word meaning “land on the long tidal river.” “Nutmeg State,” “Constitution State” and “Land of Steady Habits” are all nicknames that have been applied to Connecticut. 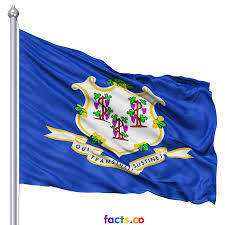 Facebook Twitter Google Date of Statehood: January 9, 1788 Capital: Hartford Population: 3,574,097 (2010) Size: 5,544 square miles Nickname(s): Constitution State; Nutmeg State; Land of Steady Habits; Provisions State Motto: Qui Transtulit Sustinet (“He who transplanted still sustains”) Tree: White Oak Flower: Mountain Laurel Bird: American Robin INTERESTING FACTS The Fundamental Orders was the first constitution to be adopted by the American colonies in 1639. It established the structure and boundaries of the newly formed government and ensured the rights of free men to elect their public officials—principles that were later embraced within the U.S. Constitution. During a candle-lit dispute that occurred when Sir Edmund Andros attempted to seize Connecticut’s Royal Charter by order of King James II in 1687, the lights went out and the charter was whisked away to safety amid the chaos. Captain Joseph Wadsworth hid the charter inside a grand white oak tree, which became a symbol of freedom and, later, the official state tree. Benedict Arnold, whose name has become synonymous with the word “traitor” after he conspired with the British to turn over the post at West Point in exchange for money and a command in the British Army, was born in Norwich, Connecticut. In 1781, he led British troops in the Battle of Groton Heights, which devastated New London, Connecticut. it traveled at speeds more than 20 knots and could remain submerged almost indefinitely because its atomic engine required only a very small quantity of nuclear fuel and no air. After 25 years of service, the Nautilus was decommissioned and opened to the public as an exhibit in Groton. The Connecticut-born Revolutionary soldier and spy Nathan Hale, who was hanged by the British in 1776, became Connecticut’s official state hero in 1985.